To cover annual operating expenses, including meals, utilities, and maintenance, the Gurukulam requires funds equivalent to at least four Gift For a Day (GFD) sponsorships everyday. In order to secure a committed source of these funds, Arsha Vidya Gurukulam offers a Family Patron Membership program. Participating families in the Patron membership program make an annual pledge of $2000 (which equals four GFD sponsorships). One of the objectives of the Gurukulam is to secure at least 300 families to participate in the Patron membership program annually. Just as in the GFD program, participating families in the Patron membership program can choose any four days during the year to have abhisekams performed to Lord Dakshinamurti. If the family cannot be present, the prasadam will be sent to them. The names of patrons will be acknowledged at the Gurukulam. Patron Membership gifts are tax-deductible. 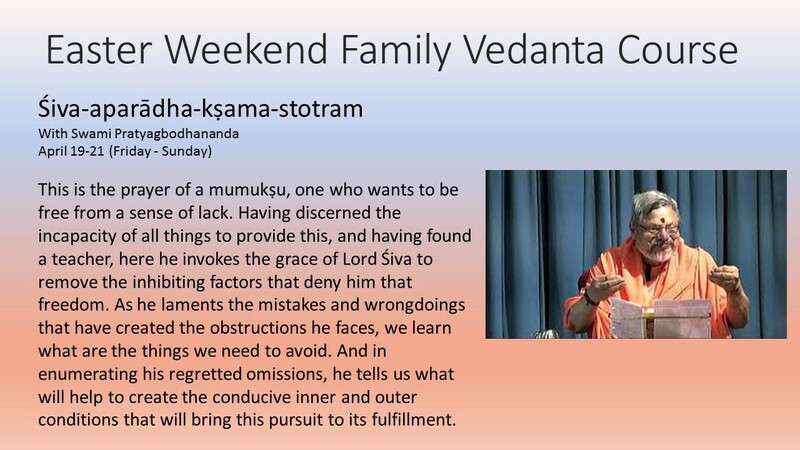 As a token of appreciation for their contribution, the Gurukulam offers to patrons the Bhagavadgita Home Study Course material and the Labor Day weekend retreat at no charge. To participate in the Patron Membership program, please contact suddhatma@gmail.com or shubha78@hotamail.comor call 570.992.2339 ext. 1-241. The Gift for a Day Program (GFD) provides the Gurukulam with vital ongoing support. Your gift of $500 for the day of your choice helps to cover a part of that day’s operating expenses, including meals, utilities, and maintenance. You can choose one or more special days, such as a Birthday, Wedding Anniversary, Memorial (shraddham), or a Religious Holiday. On the day(s) you have chosen, an Abhisekam will be performed to Lord Dakshinamurti. If you cannot be present, the prasadam will be sent to you. Your participation in this program will be acknowledged at the Gurukulam and in its newsletter. Gift For a Day donations are tax-deductible. To participate in the Gift for a Day Program, please contact shubha78@hotmaill.com or write the Gurukulam with the details of the dates and the occasion along with your gift. If you prefer to charge your GFD donation to a credit card, please call Shubha at 570.992.2339 ext. 1-241. Mastercard, Visa, American Express and Discover cards are accepted at this time. Besides the Gift for a Day and Family Patron Membership programs, the Gurukulam depends on General Donations to pay for its annual operating expenses. General donations are also tax deductible and are deeply appreciated by the Gurukulam. Any gift you give to the Gurukulam in terms of Gift For a Day, Patron Membership or General Donations can bring additional benefits to the Gurukulam through matching donations made by your company. Please check with your company to see if it has a Matching Gift program. If you need information on companies which already provide matching gifts to the Gurukulam or if you need supporting documents to encourage your company to include the Gurukulam on its list, please contact suddhatma@gmail.com. Gifts of Life Insurance and Gifts of Stocks & Bonds are two other modes of giving that you can use for a gift to the Gurukulam. There are many ways of using Gifts of Life Insurance such as donating a paid-up policy, Donating a policy that is not yet paid-up and undertaking to pay the premium, or Taking out a new policy. In all these modes of giving, you would name Arsha Vidya Gurukulam as the beneficiary and owner of the policy. Appreciated stocks and bonds can also be donated to the Gurukulam. Both the Gifts of Life Insurance and Gifts of Stocks & Bonds offer tax advantages. The staff at the Fund Raising Office at the Gurukulam would be pleased to work with you and/or your advisor in assisting you with your Gifts of Life Insurance & Stocks and Bonds. Please contact avp@epix.net or call 570.992.2339 ext. 1-217. The facilities in the Gurukulam have been growing steadily since its inception in 1986. Many new additions have been made thanks to the generosity of many who have shared the value and love for the teaching of Vedanta, and the institution that is dedicated to it. These additions include a new temple and lecture hall complex, a yoga studio, a children’s activity center, a new bookstore, an office complex, two new septic systems, and nine new residential units. As the facilities grow, the need for support also increases. Automobiles in working condition manufactured within the past 8 years or with mileage less than 100,000. Gifts of Property items may also be tax deductible for the fair market value of the property. The Fund Raising Office at the Gurukulam would be pleased to assist you in your Gifts of Property. If you have any Gifts of Property to donate to the Gurukulam, please contact suddhatma@gmail.com. Participate in our 31st Anniversary Souvenir! We thank all of you who have supported the gurukulam over these twenty seven years and invite you again to support this year’s souvenir fund-raising effort. The anniversary souvenir contains several articles on Vedanta by Sri Swami Dayananda. Sponsorships and advertisements in the souvenir underwrite the expenses of the anniversary celebration, and are vital fund-raising sources for the Gurukulam. Sponsorship is a tax-deductible contribution which directly supports the production of the souvenir booklet. At the bottom of a page of text the sponsor(s) of that page are given credit for their support. You may sponsor a full, half, quarter, or eighth page. You may advertise your business or offer a message from your family or study group. We use your camera-ready ad or design with your information. Advertisements are not tax deductible.